One of the early things I decided I needed was a way to grow and nurture seedlings. 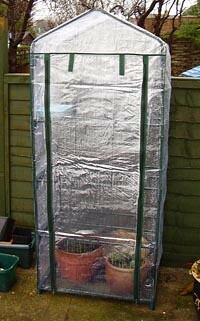 The concrete slab in the back garden gets a lot of sun, and seemed to be the perfect place to site a greenhouse. Initially, having moved house recently and gone back to being a student, a proper greenhouse was out of the question and seemed like overkill. So we went for one of these little greenhouses instead. This is basically a set of shelves with a clear plastic cover. It works pretty well actually, once we'd solved the problem of it blowing over by putting some heavy stones on the bottom shelf. My main problem with it was that the cover cracked and disintegrated after the first summer. Still, I managed to produce some of my first vegetables. The following Christmas, things got a bit more solid. We bought a little lean-to greenhouse made from wood and polycarbonate. This one is in a slightly different place to the last. I put it on the back wall of the house, over a vent brick from the kitchen. I was hoping (in a slightly permaculture sort of way) that the greenhouse would help stop the cold air getting in through the vent and the warm air from the kitchen would help the plants. I kind of forgot that we have a bit of a 'skirt' around the bottom of our house, and from about 2 feet up the lean-to greenhouse is not actually touching the back wall. Still not solved that one. Anyway. This was better. Couple of problems with it - slugs and snails got in underneath and the plastic trays that came with it are not strong enough to support the weight of the plants I was trying to grow. Plus I was missing somewhere to grow my cordon tomatoes, and we've had such disappointing summers the last two years that my outdoor efforts had been almost totally in vain. 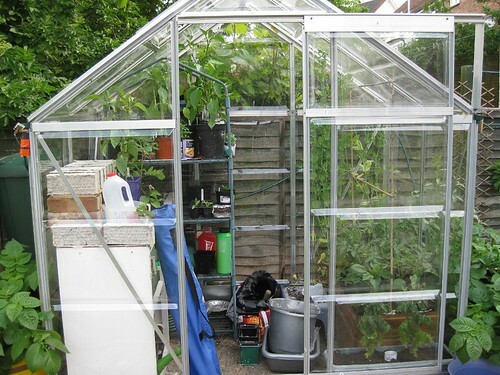 Winter 2008, we were wandering around B&Q (as we do), and found a free-standing, 4'x6' greenhouse on sale. It was nearly £200, and I wasn't convinced we had space. Besides, it was silly, wasn't it? And I had the little lean-to one. So we came away without buying it. But I kept mulling over what I could grow in it, and eyeing up the internet to see if there were any better options. My Gorgeous Girlfriend did her normal, much more practical stuff and went and measured the gap on the concrete where we could possibly put it, and discovered that it would fit. 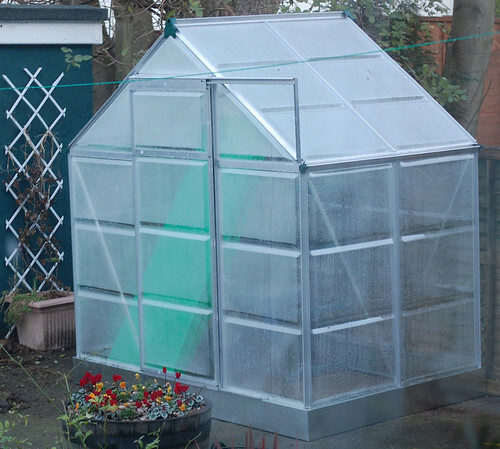 Before you could say 'My, what a small greenhouse' we bought it. The original greenhouse (shelving with a plastic cover) now sits inside the new greenhouse as a very useful set of staging. The old chest of drawers that we put a tile top on and took all the drawers out of now lives in the greenhouse, housing my pots, a watering can and a large number of newspaper logs (well, around 32 I think). There's a shelf along the back of it made from bricks taken out of the old fireplace with a left-over bit of flooring across them. 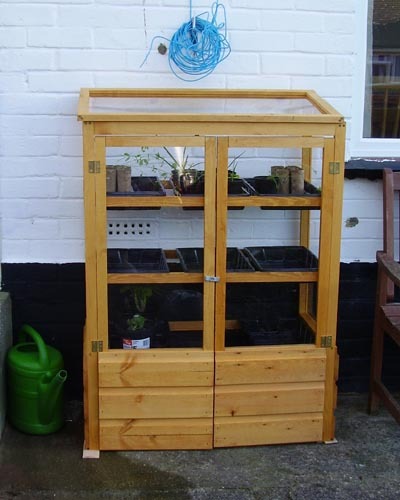 GG built me a large wooden container - around 40cmx80cmx40cm - which is now full of tomatoes growing really strongly. It has been a brilliant purchase, and I'm so glad she talked me into it! Of course, the wooden lean-to greenhouse has not been abandoned either. 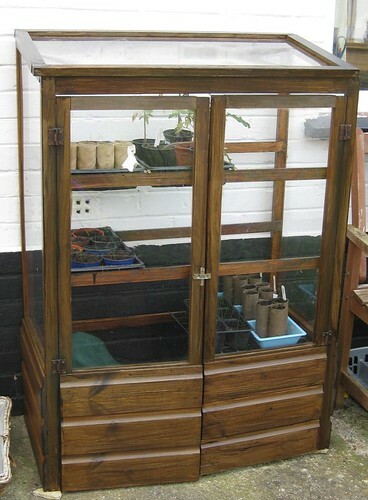 In fact, it's been given a coat of woodstain, the trays have been reinforced with some trimmed-to-fit bamboo, and it's working really well as an annexe to the main greenhouse. It isn't as sunny, so therefore not quite as warm, which is perfect for a lot of seedlings. (I will admit to using slug pellets in the bottom of it to counter the slug/snail problem - I figure the birds and hedgehogs won't get in there, and the slugs seem to be dying in situ. It is the only place I've used them...) The two are working together really well, and fingers crossed we'll have a bumper harvest from the veg plot as a result.